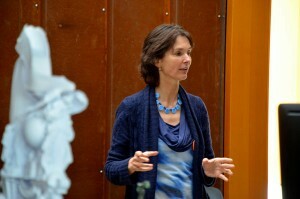 Anne Berk is a respected Dutch art critic, curator, educator and lecturer. She is actively involved in the European sculpture network. She likes to share her profound knowledge and passion for the arts with the public. Art is essential and reflects the experience of life. Trained in sculpture and art history, Anne Berk wrote more than a thousand articles for a.o. Kunstbeeld, Het Financieele Dagblad and a number of monographs on international contemporary art and sculpture. Her book Bodytalk (Waanders, 2004) deals with the shift from abstract to figurative art in Dutch sculpture, in the context of changes in society. She also made an exhibition on the topic in Museum Beelden aan Zee NL. She explored this subject internationally with In Search of Meaning, the Human Figure in Global Perspective, including a book and an exhibition in Museum De Fundatie NL (2015). She also made the exhibition Jenseits, Beyond the Body (2012) at Weltkunstzimmer Düsseldorf, which will get a follow up in 2018 at Kunstcentret Silkeborg, DK. Currently, she does research for an exhibition Object Love, about our emotional relation with things. Anne Berk is a much sought lecturer. She set up her own contemporary art-course, KunstNaderBekeken and organises art trips togehter with art historian Saskia Wijne.